The weather in Alaska is.... moody. Inclement is a good word for it. 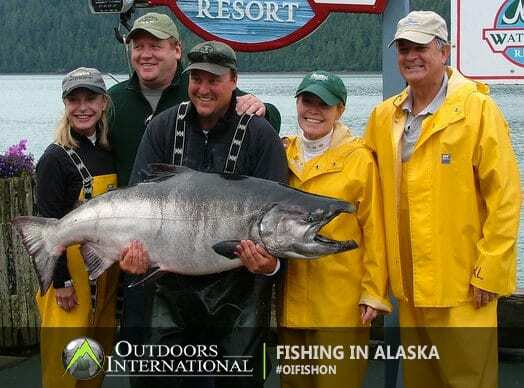 Going fishing in Alaska and not sure what gear to bring? Here at Outdoors International, we want to be sure that your prepared for your fishing trip. The weather in Alaska is…. moody. Inclement is a good word for it. One afternoon it might be 75 degrees, sunny, balmy even, then a front moves in and the wind starts blowing. It starts raining. Maybe even snowing, who knows… be prepared for everything when in comes to packing for an Alaska fishing trip. A good “layering system ” is the best strategy, bar none, for staying comfortable. We recommend starting off with a polypropylene or Merino wool base layer next to your skin to wick moisture away from your body. Your second layer or alternative layer could be a medium to heavy-weight fleece, Merino wool or polypropylene shirt, sweater or pullover. Your final layer is the jacket that you choose to protect you from both wind, and rain. Anglers should also bring a few pair of heavy wool socks. We recommend that you try on your socks with your waders in your wading boots before coming to the lodge to insure that you have plenty of room to move your toes. Being unable to move your toes and the cramping of your feet in your boots are the biggest reasons for numb toes and cold feet. At the height of the season, most of the action will be for silver salmon mixed with good numbers of 2 ½ to 5-lb. rainbow trout, Dolly Varden, with the odd grayling thrown in for variety. For salmon, 8-weight rods are easier on the fish and the angler. For trout and grayling, 4- to 6-weight rods are good, but essentially these fish are feeding on eggs and flesh and the flies are heavy, often fished with sinkers to get the egg patterns down, so a sturdier trout rod such as a 6-weight is perfect for the job. You can in certain times of the year fish dry flies particularly for grayling, so having a lighter rod along for that can be fun. Large arbor reels are a big help here for their retrieval rate which helps land salmon, rainbows, and Dolly Varden faster and is better for the fish. A light trout reel for the dry fly rod works well as grayling are not going to run far. You should have a reel with a spool for each of the larger rods with a floating line and a sink-tip line. The dry fly reel is obviously rigged with a floating trout line . Inevitably your guide is going to rig up what is working, but going on a fishing trip without flies is heresy. It’s like showing up to the prom with no corsage. Flashy streamer patterns such as the egg sucking leach, a purple and pink marabou concoction locally called a popsicle, fuchsia bunny flies, woolly buggers, flesh flies, salmon egg patterns, and just plain glo bug yarn are all effective. Other patterns commonly used are muddlers in various shades of black and brown, woolly worms, Mickey Finns, but probably 90%-plus of the silver salmon are caught on egg sucking leeches and popsicles. Grayling can be caught readily on dry flies . The Adams is probably the best pattern. Black gnats, mosquito, royal coachman, and other common patterns also work. For those wanting to try some specialized angling, fishing with deer hair mouse patterns and a floating fly line in the low light of evening can be a very exciting way to take rainbows on topwater, no less. Fly-fishing packs are the best way to carry what you need for a day in the Alaskan wilderness. Waterproof packs are even better. Essentially you want a larger pack to carry extra layers and then a fishing pack such as a sling pack or a hip pack to carry flies, leaders, and other accessories. This can actually be transported to the river inside the larger pack and you are not going to need every accessory and every box of flies you own. Your guide will tell you what you need and generally you will be fishing the same species during the course of the day. Take what you need in the smaller pack, and pack what you think you need in the larger pack, which can stay on the shore, in the boat, or on the plane. Once again this is not about needing everything under the sun: good forceps with scissors, a good nipper on a zinger, leader material from 4X up through 0X, indicators, and non-toxic split shot (it is doubtful you’ll be fishing alone and without a guide who will have all of the terminal tackle rigged and ready, but it doesn’t hurt to have some backup). If you want to carry a lightweight net, then carry one. Chances are the guide will land the fish. A wading staff is excellent if you’re going to be out of the boat. As in every other style of fishing, sunglasses are critical. Take three pair; a backup for your backup. Wear croakies to keep them from falling off and floating down river. Make sure your main pair are superior polarized lenses to cut the glare and allow you to see the bottom as well as the fish. Your backups can be lesser and there are some great less expensive fishing glasses out there.